Leaders of the Arab countries on Sunday issued “Tunis Declaration” of the 30th Arab summit, hosted by Tunis under Tunisian President Beji Caid Essebsi. The declaration stressed that the Arab countries are united by strong cultural ties and brotherly historic relations, decrying differences and conflicts in the region that have led to undermining Arab solidarity and national security. It also added that such differences contributed to having interference in the internal affairs of Arab countries. The declaration stressed the necessity to provide security and stability in the region to put an end to all tension and conflicts with a view to reaching comprehensive political solutions for all current crises. It also urged to secure Arab and national reconciliation as a key guarantee for stability in the region to prevent any foreign interference. The declaration stressed that the fair and comprehensive settlement of the Palestinian cause is the key factor to achieve peace, security and stability in the region. It also urged the international community and the UN Security Council to provide protection for Palestinians and put an end to the Israeli aggression and violations. The declaration reiterated outright refusal to any Israeli unilateral measure, which could change the historical and legal status of East Jerusalem, especially any actions concerning to the Muslim and Christian sanctities and holy sites in the city. It also called for achieving a comprehensive political settlement in Libya, reaffirming the unity and sovereignty of the Arab country and rejecting any military solutions or interference in its internal affairs. It urged to restore security and stability in Libya and end the suffering of its people through reaching a political consensus-based settlement. The declaration appreciated the role played by Libya's neighboring countries, particularly the initiative launched by Essebsi in coordination with Algeria and Egypt to help Libya overcome its crisis. It backed all efforts aiming to eradicate terrorist organizations and their dangers posed to Libya, neighboring countries and all nations of the region. The declaration anew stressed the importance of politically settling the Syrian crisis according to Geneva peace talks and UN Security Council's resolutions, refusing any kind of military options which complicate the crisis and increase the Syrian people's suffering. It insisted that the Golan Heights is an occupied Syrian territory according to the International Law, refusing any attempts to impose de facto policy in favor of Israel's sovereignty or any decision aiming to change the legal or demographic status of Golan. It also urged the international community to bear its responsibilities for the Syrian and Palestinian refugee crises and find radical solutions to help them return to their homelands. It stressed full support to regional and international efforts to restore the legitimacy in Yemen and put an end to the Yemeni people's suffering, asserting the importance of Houthis' commitment to cease-fire agreement and continue negotiations. The declaration hailed the progress and success achieved in Iraq after conquering the terror groups, praising the sacrifices made by the Iraqis while defending their country. It also stressed the importance of maintaining the sovereignty and unity of Iraq, and supported its efforts for reconstruction. It urged the Arab states to boost their cooperation and security coordination to uproot terrorism and drying up its financial resources through activating the Arab action for fighting terrorism. It called for supporting dialogue among different religions, as it could serve spreading the values of tolerance, human solidarity, and respecting the differences. It asserted that cooperation between Arab countries and Iran is based on good-neighborliness principle. Such cooperation also depends on avoiding interference in internal affairs or use of force or threatening to use it, in addition to avoiding practices that could lead to undermining trust and posing threats to security and stability in the region. The declaration condemned the firing of ballistic missiles against Saudi territory, stressing that the security and stability of Saudi Arabia is essential for the security of the Arab Gulf and the Arab regional as a whole. It also reiterated the absolute sovereignty of the UAE over the three islands of Abu Musa and the Greater and Lesser Tunbs, supporting all peaceful procedures taken by the Arab country to retake sovereignty over them. The declaration urged Iran to respond to the UAE's initiative to find a peaceful solution for this issue through direct negotiations or restoring to the International Court of Justice to contribute to building trust and enhancing security and stability in the Arab Gulf. It voiced full solidarity with the Sudanese government in its efforts aimed at boosting peace and development, welcoming the improvement in security conditions in Darfur. It supported Sudanese President Omar al-Bashir's initiative to achieve Arab food security, calling on the Arab states and funding institutions to invest in the initiative's projects. It asserted its full support to Somalia's efforts to rebuild its institutions and confront the economic challenges. It also welcomed the presidential elections in Comoros, hailing the atmosphere in which elections had been held. The declaration hailed the UAE initiative to establish Pan-Arab Group for Space Collaboration. It also stressed the necessity to have economic and development dimensions for Arab common action. It reiterated the urgent need to double common efforts to enhance economic cooperation and make use of natural, financial and human capabilities of the Arab countries. 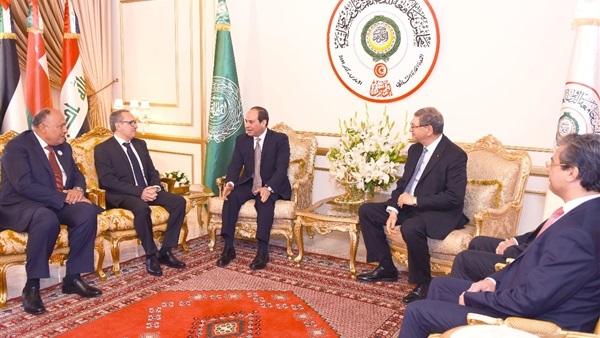 It reaffirmed support for the Arab League, praising its great role played in the Arab world. The declaration extended thanks to the Tunisian president and people for hospitality and warm welcome to organize that summit successfully.